In October we saw the launch of the Centenary Trail in Canberra, a 145 kilometre self-guided trail for walkers and cyclists. Following fire trails, walking tracks and shared paths in urban and natural areas it showcases Canberra and takes users on a journey between urban and rural environments past iconic sites and hidden treasures. 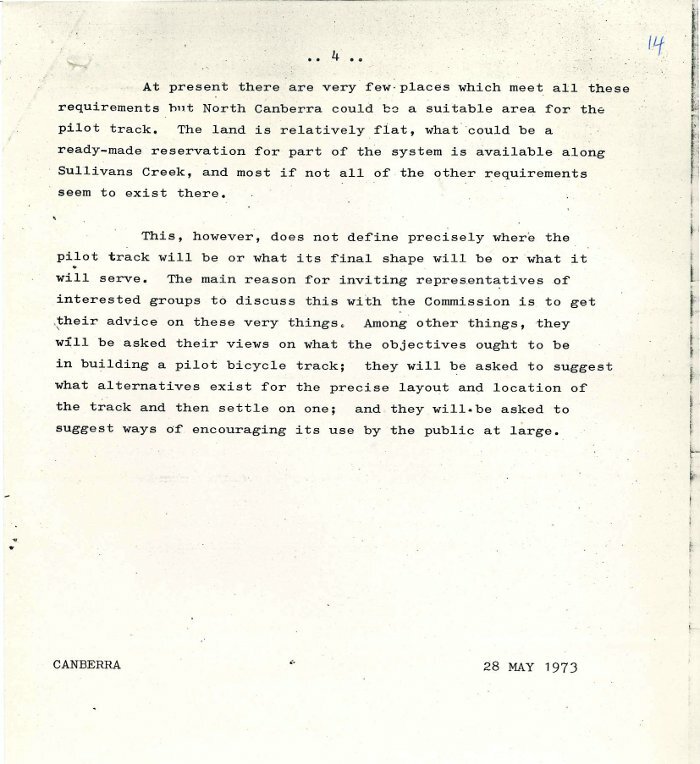 The Centenary Trail is just the latest addition to Canberra’s extensive bicycle path network which began 40 years ago with a single pilot path running between Dickson and the City. 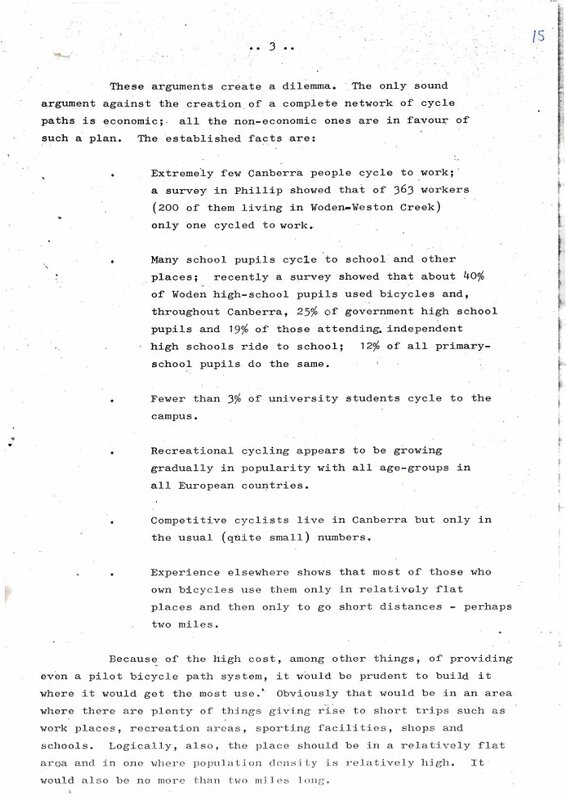 The file ‘74/10 – ACT Tourist Bureau – Bicycle Path Canberra’ documents the opening of this path and is ArchivesACT’s Find of the Month. 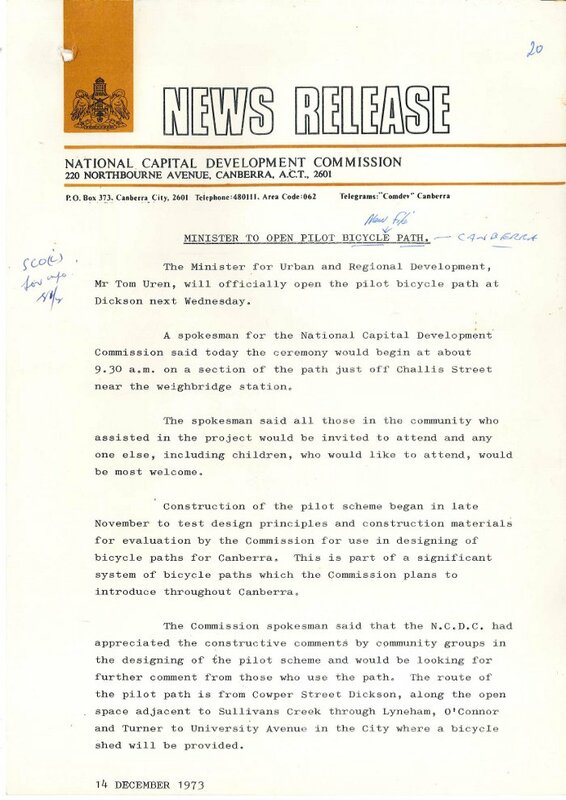 In May 1973 the National Capital Development Commission (NCDC) discussed plans for a pilot bicycle path system in Canberra with interested parties. This was to be the first step in a long term plan to “have a multi-purpose trail system throughout the Canberra region”. 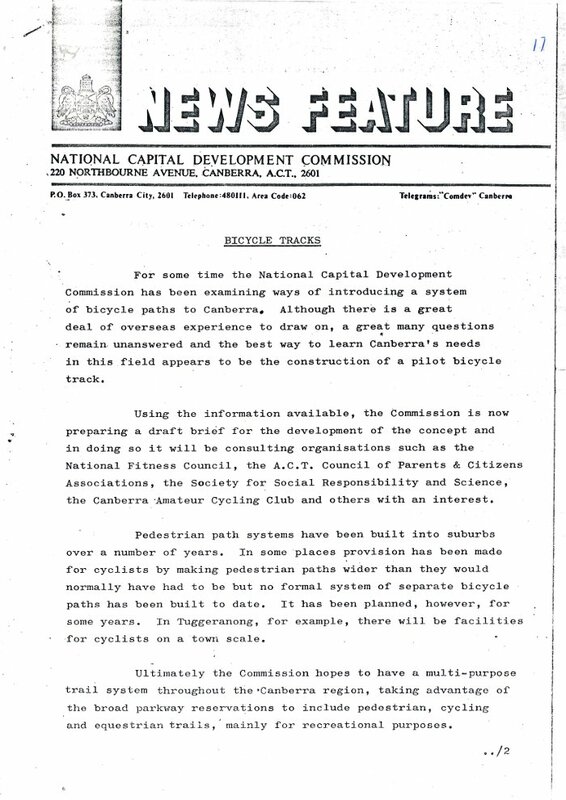 The following NCDC News Feature highlights the pros and cons of a complete bicycle path network in Canberra. It notes that “philosophically there are many advantages in the wide community use of the bicycle and virtually no disadvantages”. 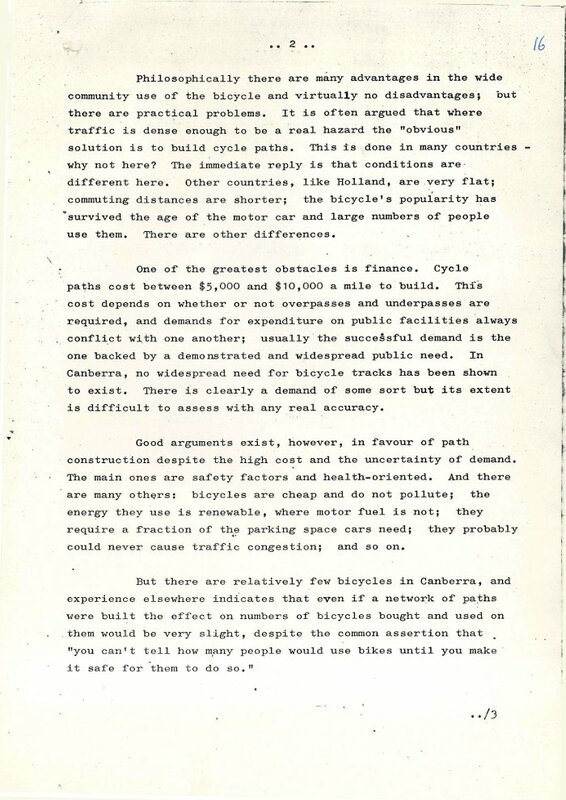 A particularly interesting argument for 1973 was that “the energy [bicycles] use is renewable, where motor fuel is not”. The only disadvantage the NCDC could see was the economic one. Bike paths were expected to cost between $5000 and $10,000 per mile ($5345 to $16,090 per kilometre), depending on whether over- and under-passes were needed. A 4.3 kilometre pilot path running between Cowper Street, Dickson following Sullivan’s Creek to University Avenue, City was constructed in November 1973 at the cost of around $100,000 – considerably more than the estimates in the News Brief earlier that year. 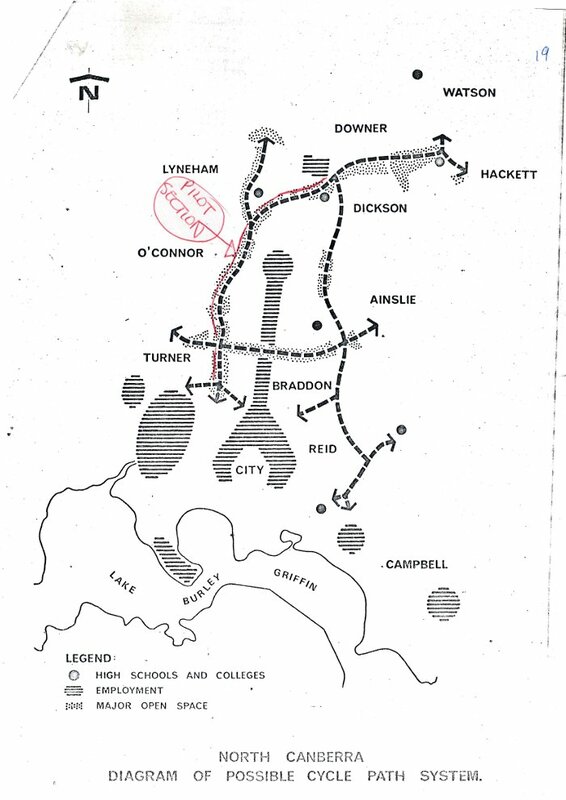 The path was opened on 20 December 1973 by the Minister for Urban and Regional Development, Tom Uren. Mr Uren strongly supported the use of alternate transport over automobiles stating in the Sydney Morning Herald at the time that “Cars are monsters in inner-city areas throughout the world” (1). The Canberra Times reported that the “first official cyclists” were to be local media identities Frank Jones (CTC-TV), Michael John Fewster (2CA) and cartoonist Larry Pickering (Canberra Times) who were to “stage a race along it after the opening ceremony” (2). They were followed by Mr Uren and the NCDC Commissioner William Andrews “accompanied by nearly 100 youngsters” (3). This pilot bicycle path enabled the NCDC to evaluate design principles and construction materials for designing the future path network. They have become an integral element of neighbourhood design beginning with Tuggeranong during its construction phase in the 1970s to 1990s. Canberra now boasts one of the best bicycle path networks in Australia, all of which can be traced back to this single pilot path.